I’ve partnered with The J.M. Smucker Company to bring you this post. 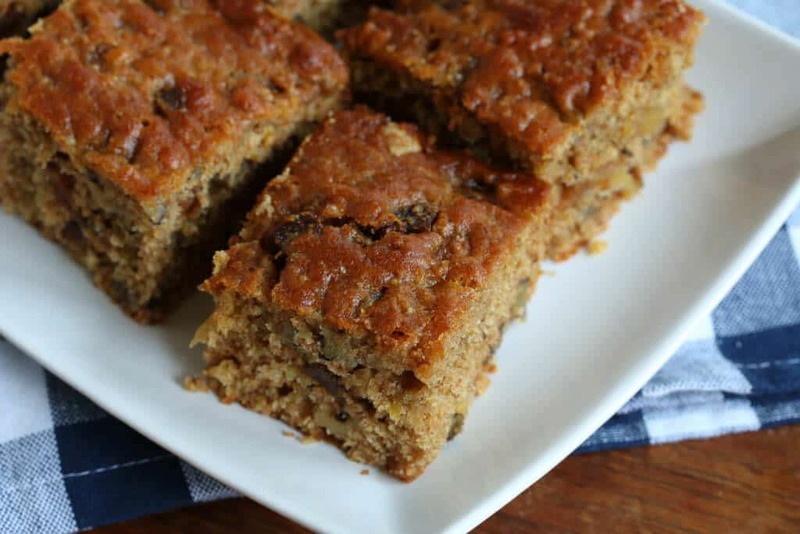 Packed full of whole grains, fruits, nuts, healthy oils and no refined sugar, this hearty millet cake will satisfy the sweet tooth without layering on the guilt! I’ve been baking quite a bit lately, focusing on healthier treats for my kids and family. Like my Mega Healthy Triple Chocolate Cupcakes, I especially like creating deceptively healthy treats that satisfy the sweet tooth while possessing some redeeming qualities like whole grains, healthy oils, nuts and not refined sugars. Along the same lines are my Whole Grain Almond Fruit Bars which were inspired by seeing Smucker’s new Fruit & Honey fruit spreads while shopping at my local Fred Meyer. I avoid 95% of what’s on the jam shelves because they’re usually laden with high fructose corn syrup. So I’m always happy to see options out there that are sweetened with honey, like these jams. Let’s talk about today’s recipe. If you’re health-conscious but still like to indulge, here is something you can enjoy without feeling too guilty. Made with 100% whole grains and healthy oils, no refined sugar, and packed with millet, fruits and nuts, this is a dessert you can actually feel good about eating. My 6 and 8 year olds inhale this stuff and, unlike many desserts, I’m more than happy to pass it their way because it’s packed with healthy ingredients. 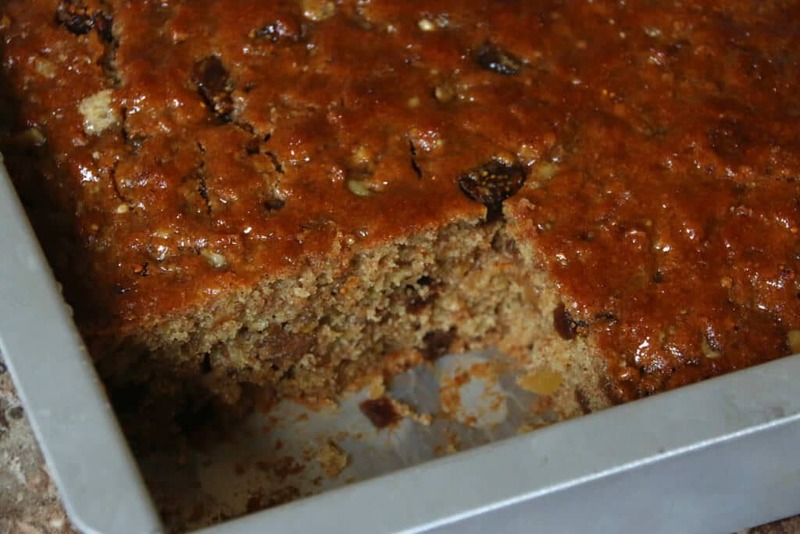 I like to bake and cook with a large variety of grains and this cake features millet, an ancient grain that is rich in B vitamins, iron, calcium, zinc and magnesium. This cake is best eaten fresh out of the oven while it’s still warm and moist. This recipe calls for figs but you can use dates or prunes instead. And you can also throw in a few raisins if you like. Hazelnuts are another great option instead of walnuts. Whichever substitutions you use, before long long you’ll be enjoying a slice of this warm, hearty cake fresh from the oven! Cook the millet and set aside to cool until ready to use. In a separate bowl, beat the eggs with the honey and olive oil then add the vanilla, lemon extract and lemon zest. Beating just until combined between additions, add half of the flour mixture, then half of the buttermilk and repeat. Be careful not to over-beat. Stir in the millet, chopped figs, candied ginger and walnuts. You’ll have a very thick batter. Spread the batter into a greased 8×8 inch pan. I use and recommend Magic Line’s pan. In an oven preheated to 350 degrees F, bake for about 30 minutes or until a toothpick inserted into the center comes out clean. Heat the honey and lemon juice for 30 seconds on HIGH in the microwave. Use a fork to pierce holes throughout the cake. While the cake is still hot, pour the warmed honey over the cake, using a knife to evenly guide it. Let the cake sit for about 10 minutes and then cut into squares and serve while still warm. 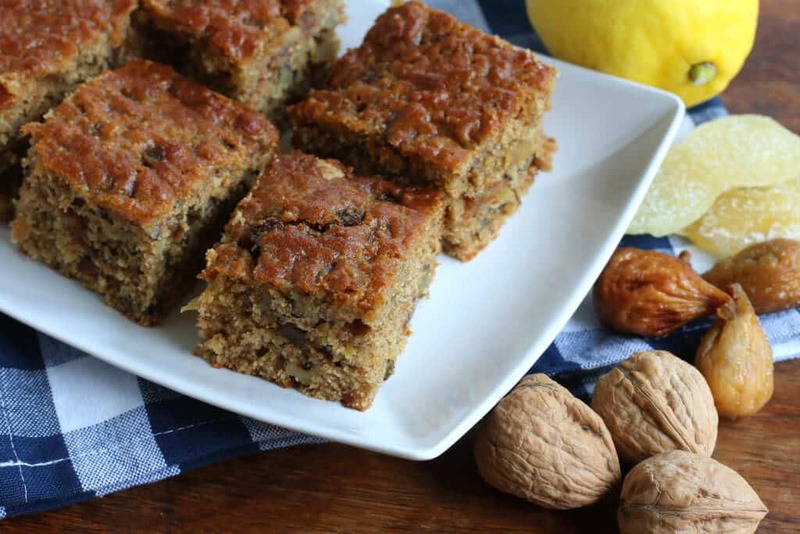 Packed full of whole grains, nuts, fruits, honey, healthy oils and made without refined sugars, this hearty cake will satisfy the sweet tooth without all the guilt! Combine the flour, baking soda, baking powder and salt in a bowl and set aside. In a separate bowl, beat the eggs with the honey and olive oil then add the vanilla, lemon extract and lemon zest. Beating just until combined between additions, add half of the flour mixture, then half of the buttermilk and repeat. Be careful not to over-beat. Stir in the millet, chopped figs, candied ginger and walnuts. The batter will be very thick. Spread the batter into a greased 8x8 inch pan. Heat the honey and lemon juice for 30 seconds on HIGH in the microwave. Use a fork to pierce holes throughout the cake. While the cake is still hot, pour the warmed honey over the cake, using a knife to evenly guide it. This is a sponsored conversation written by me on behalf of The J.M. Smucker Company®. As always, all opinions are 100% my own. It looks great. We eat a lot of millet mostly as casserole with lots of veggies but I have never thought of baking with it. Great idea! Thanks, Adina! I love experimenting with a wide variety of grains. 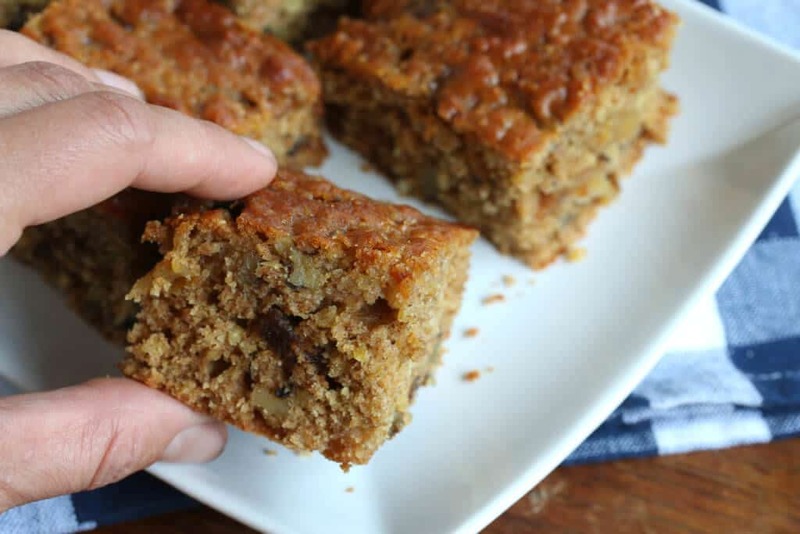 I love baking with quinoa and thought I’d try millet – it turned out very nicely! This looks awesome! I love that it uses millet. 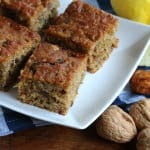 It’s so fun incorporating grains into baking! The only good thing about cooling temps?? Beautiful cakes such as THIS! I love those flavors! Thanks, Katerina! I agree, there’s nothing like cool weather to get you in the mood for baking! Delicious fall comfort baking. Love it! For sure, Maris! My kitchen smelled heavenly! Lovely recipe, millet is super delicious and underutilized! It really is! I love experimenting with the whole range of grains, so many great options out there. The general consensus is that there are no convincing studies to confirm that. What does seem to be the case is that heating honey damages some of its nutrients. Thanks so much for sharing! I can’t wait to try it out! 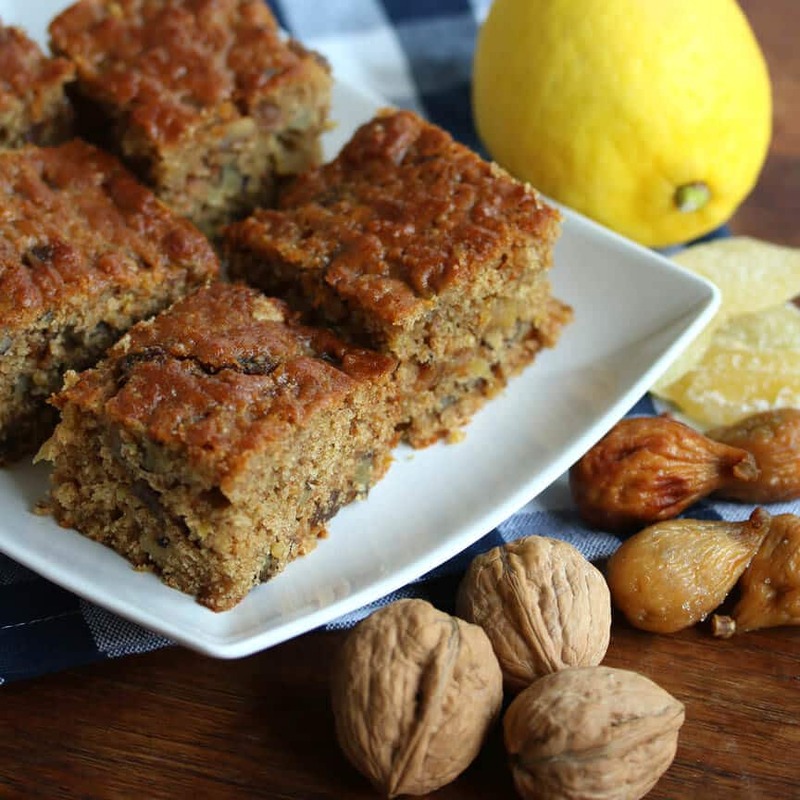 I have just found your web site and wanted to make the lemon millet fig cake with walnuts and candied ginger but I don’t have any millet in stock and would like to substitute it for something else please can you suggest anything. Can I use more spelt flour ? Hi Janet, the cooked grains add moistness and texture to the cake – another great option is substituting the same amount of cooked quinoa. You can add a little extra flour instead if you prefer, but not too much or you risk having a dry cake. Hi Saras, ginger powder won’t have the same flavor or effect but if you do add some I’d aim for 1/2 teaspoon to no more than 1 teaspoon. You can also make your own candied ginger if you have the time and inclination: https://www.daringgourmet.com/how-to-make-crystallized-ginger/. Another alternative would be to add chopped candied lemon peel instead. Thank you for your suggestions! In the meantime I couldn’t resist myself to bake with quinoa, since I had saved two of your quinoa recipes from long time. So tried your https://www.daringgourmet.com/honey-olive-quinoa-cake/ with some tweaks. Will post my comment there. Thanks again!